With the extreme cold I wasn't sure we would get this trip in again this year. We were sure the trail hadn't been broken, so a week previous Wayne Phillips broke trail from Stemple Pass to above Rooster Bill Creek. Then, on Thursday, we broke trail to just beyond the big hill and avalanche chute from Flesher Pass. So, we figured we had about half the trail broken when we did it Saturday, leaving about 6 miles to break. Wayne's son, Rob, from Helena and his wife, Jamie joined Gordon Whirry and myself to begin the 12 mile journey, which gains about 2,300 feet along the way. From what I had seen Thursday, ice and wind crust, I was skeptical that this trip would be pleasant. 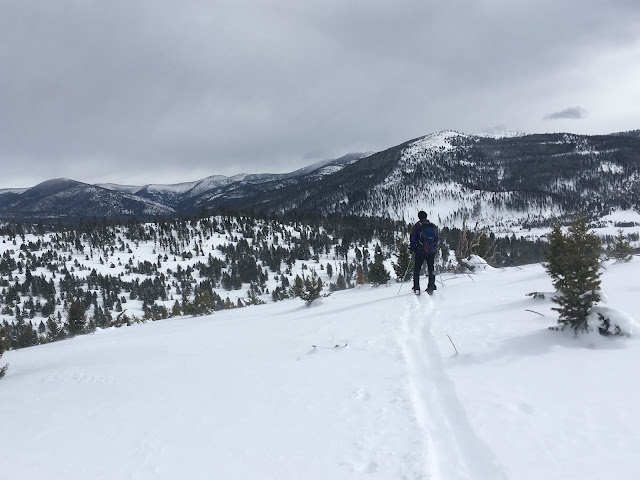 However, we had temperatures in the mid-20s, blue skies and winds to our back and the broken trails had been covered with a dusting of wind-blown snow, making the skiing ideal until the afternoon. In the afternoon we had to apply glide wax because we got snow buildup under our kickers. The ideal weather enhanced this ideal Continental Divide trip that took us 9 hours and 19 minutes to complete. I'm convinced we could have shaved an hour if we hadn't had to deal with rewaxing and struggling with a downclimb of the high hill. Rob Phillips navigated a near perfect off-trail line to avoid an avalanche chute above Rooster Bill that connected us to the CDT and broke trail nearly the entire distance. Despite the ideal conditions, we saw no on else along the trip until Wayne greeted us at the bottom of the hill with hot-chocolate, cheer and a poetic reading from Ivan Doig's "Heart Earth," that he had begun reading while waiting for us. The last 1.8 miles had been wind and sun-hammered and were very fast and treacherous and caused many falls. Jamie, on only her second backcountry trip and on sub-par gear, performed amazingly. But, who could complain after an amazing journey on this section of an American treasure --- the Continental Divide Trail. After 32 days where the thermometer never broke freezing and a February that averaged below zero, we finally got a break in the weather, albeit temps in the teens and 20s. I took full advantage this past week with multiple backcountry ski and telemark trips including another Cadotte Gulches 2 and 3 traverse, the Trail 747 Porphyry Peak traverse in the Little Belts, MacDonald Pass cross country ski area on the Continental Divide west of Helena, and a modified Deadman run in the Little Belts. Perhaps the most noteworthy was the Deadman run, a real favorite that travels down a north-south ridge from Kings Hill Pass to Deadman. 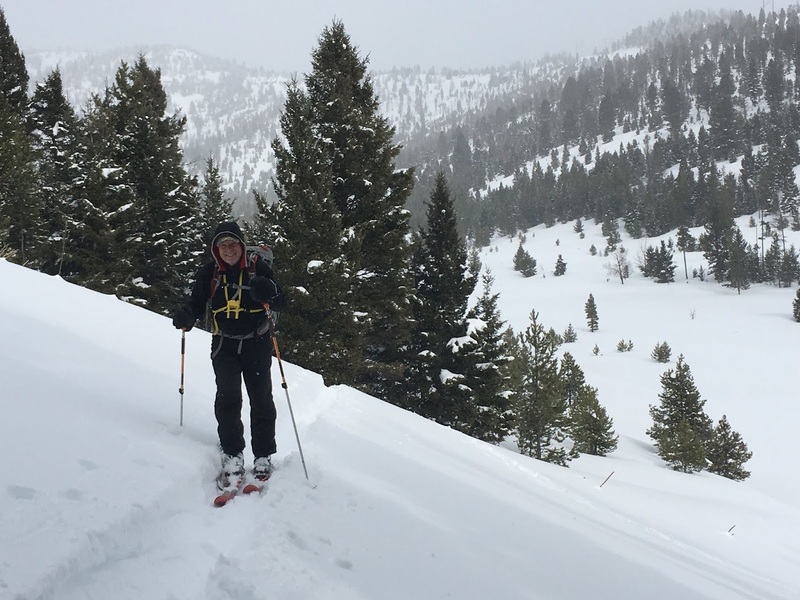 I didn't have much energy for this trip, so I decided I would cut it short at the Deadman Road and come down a steep drainage to US 89, cutting off almost two miles of the run, but allowing me some real backcountry in steep terrain on a gorgeous, narrow bottom with tons of snow. I hadn't really planned on this trip, setting off instead to do a short loop from the pass, so when I got to the bottom, some 4.25 miles from the pass I was without a ride back up. I had been lured into the longer ski by tremendous snow and gorgeous, blue skies. I tried hitchhiking, but the cars going from White Sulphur Springs to the pass were sparse and no one was willing to pick me up. That's when I checked my GPS and estimated it was 4.25 miles and 1,100 elevation gain back to the pass. I was able to get on top a snow berm created by the snowplows and with a strong wind to my back slogged three hours up to the pass. When I was finished I had gained about 2,000 feet and put in 10 miles on this total trip and was exhausted. While this is doable, I don't recommend it, although the snow was perfect and I had gotten in numerous turns. I hadn't done MacDonald Pass ski area in more than 10 years and was pleasantly surprised by the snow there and climbed the powerline up to the microwave tower, some two miles and almost 1,000 feet up. The snow was in great condition for the telemark trip back down. On the Cadotte traverse, we did it with Wayne's Wednesday group and in reverse from the way Mark Hertenstein and I had done it a week previous. We encountered high winds, but spent considerable time in the final stretch yo-yoing a telemark slope. On the 747 traverse of Porphyry I fell victim to being pulled down a steep drainage when I lost the trail, coming out about a mile from the trailhead. The snow was perfect. You might note that I said the snow was perfect on each of these four trips. We've had to wait for the weather to break, but it seems as though the wait was worth it. I've been trapped in town by the bitterly cold and snowy weather unable to enjoy the backcountry for three solid weeks! That came to an end Wednesday when Wayne's walkers took to the Cadotte Creek ridges just west of Rogers Pass, and again Friday when we completed an unfinished Wednesday loop. We weren't out for too long either day, but were able to ascend one of those ridges, experiencing great powder and not much wind crust. We've averaged about a degree below zero for the entire month and have topped it off with high winds, sending daily wind chills to 30 and 40 below! I've long touted this area, but have had difficulty getting friends to join me there. It is nearly as close as the drive to Kings Hill in the Little Belts --- 71 miles to Rogers Pass and another 5 miles to a great, plowed Cadotte Creek parking area. A gain of a mere 400 feet makes one feel high in this alpine country. It was out and back on Wednesday. This area has a series of parallel gulches running west from Cadotte Creek, starting at Cadotte and running consecutively Third, Second and First gulches to Bartlett Creek. On Saturday we ascended Third Gulch Ridge as we had on Wednesday, but then continued a loop that took us to Second Gulch and back. We cut it a bit short by telemarking off Second Gulch to the valley floor, about a half mile from where we had parked our car just below the Third Gulch Ridge point. We covered three miles and more than 1,000 feet in elevation gain. The views all the way are spectacular --- this is Continental Divide Trail country. There's Rogers Peak and the ridge to Flesher Pass to the east and south, and ridges that lead to Cadotte Pass to the north. Once a ridge is attained these mountains look really huge. I just don't understand why backcountry skiers aren't flocking to this area. We had tons of wind Friday. It made me feel as though I was on the east side of the mountains. This area has a large herd of wintering elk and we saw numerous moose sign. While we hued to the ridges, the bottoms are equally inviting in all of these gulches, broad expanses that slope gently up hill. Wayne will take his group, including me, on the full loop next Wednesday. This is why they call the mountain "Castle" Reef. In the alpine glow. I haven't posted for nearly two months, but that doesn't mean I wasn't out and about. The holidays, travel and family concerns kept me busier than I wanted to be and I had to let this go. In that period, there were several more ski trips in the Little Belts and travel to California, where we hiked on Christmas Day in the Sierra foothills east of Sacramento and then HIKING (?!) in the Rocky Mountain Front in mid-January. I'm getting very concerned about our lack of snow, particularly in the Rocky Mountain Front. 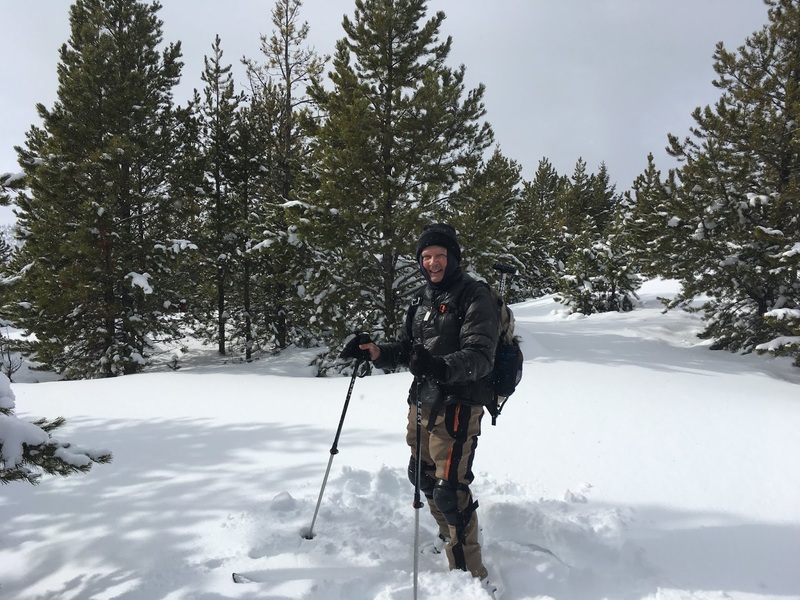 We took our backcountry skis to the Front on Saturday and ended up abandoning them for hiking boots. We scaled ridge lines on both sides of Hannan Gulch and enjoyed tremendous views of the Sun Canyon area. 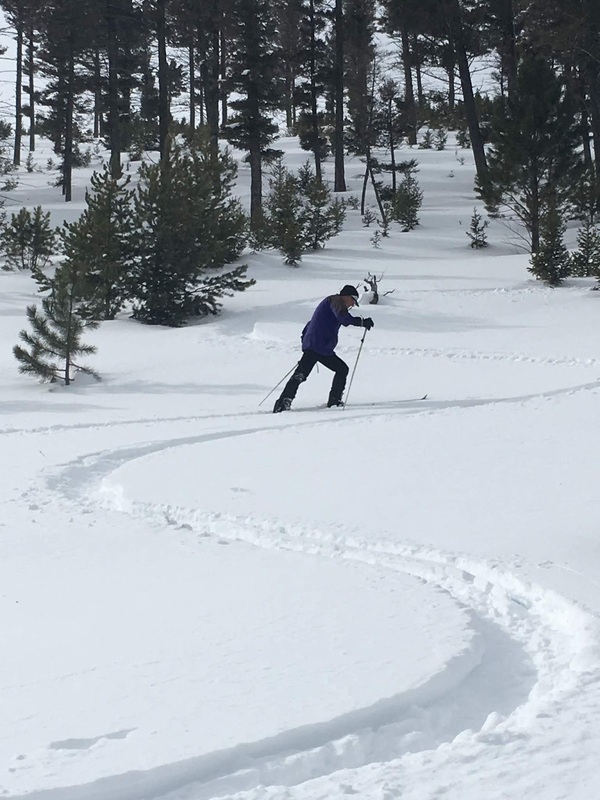 On Wednesday our Wayne's group broke the upper portions of O'Brien Creek and followed the feint tracks of someone who had skied the area before nine inches of powder had fallen. When we hit it the sun had already softened it, requiring us to reapply glide waxes several times to prevent clumping. Down below the Showdown hill, snow is sparse and not in good shape. In California the drought persists. I regularly visit Folsom Lake and have never seen the reservoir this low. The fires were north of there in Paradise. Sure hope they don't sweep up this pretty area. 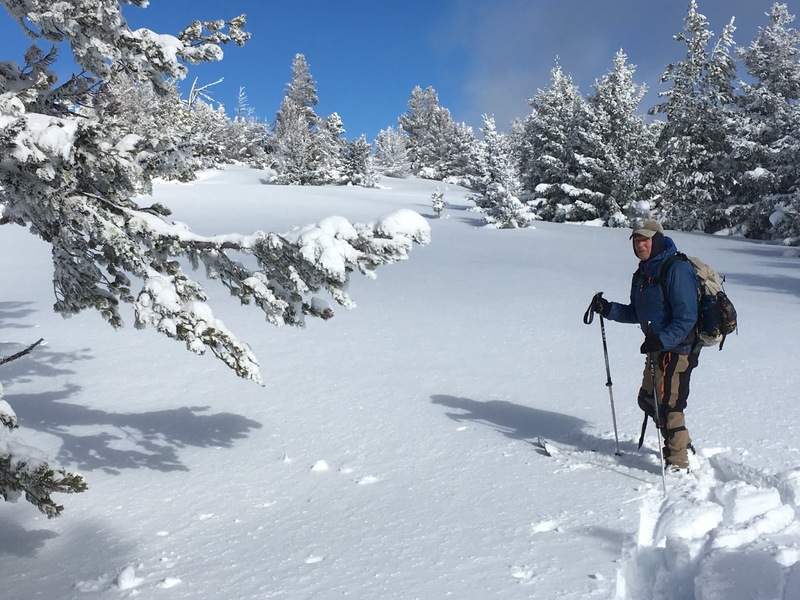 Backcountry ski season begins; snow is great! I guess because I'm always anxious for the backcountry ski season to begin I think I'm getting a late start every year. 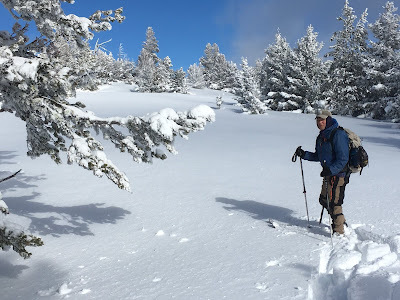 I got out Sunday and skied up the road toward Deadman and at the top headed toward a sweet telemark spot in the Deadman Creek headwaters, taking a couple of turns before following the powerline above the Weatherwax bowls to Kings Hill and back down to the pass. We had a beautiful, if windy day with temperatures in the low 20s. We estimated the base at about 18 inches and already set up. Across the road at Showdown Ski Area the groomers have been at work on Big Seven, but the runs to the south were tracked by powder enthusiasts. It's been a while since I hiked to Devil's Glen on the Dearborn River, an easy trek in this limestone canyon of translucent emerald waters and cascades beneath Steamboat and Monitor mountains. The last time was before the Scapegoat Wilderness boundaries were expanded by Congress under the Heritage Act to include this scenic area. I love the new Scapegoat Wilderness sign just beyond the Forest boundary. It is a 2.5 miles hike one-way from a trailhead across the road from a Christian guest ranch and retreat center. The land ownership in this area is as ugly as the area is beautiful. It is near where neighbors fought over access issues and one murdered another. A landowner closed off access to the Falls Creek roadless area several years ago. The access to Devil's Glen is so tight that a thin one-mile trail from the parking area parallels a road cluttered with no trespassing signs. There has been an encouraging development in the area, though. 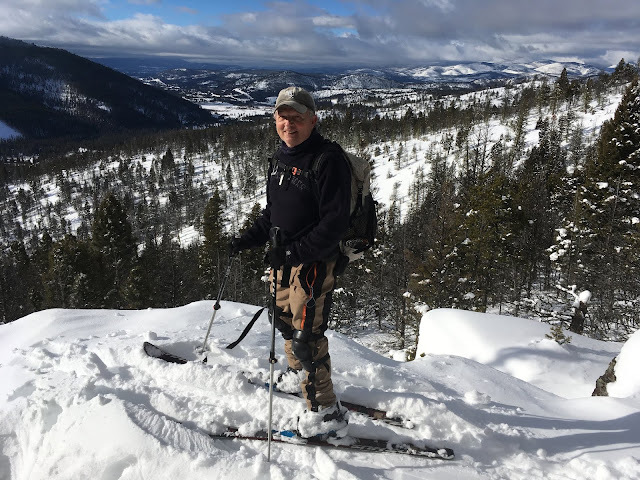 The Rocky Mountain Elk Foundation has negotiated a deal to buy access into Falls Creek and is raising money to that end. I took off from Great Falls around 10 a.m.,and was back in town from my hike by 4 p.m. The trailhead is a mere 72 miles from town by way of Augusta or Highway 200 cutoff to Bean Lake. Of note, there was tree thinning for fire protection going on private property. These folks are going to need it. I was still recovering from the Ousel Peak climb on Saturday when Katie proposed to head back to golden larch country on the Middle Fork Flathead on Wednesday to climb Apgar Lookout near Glacier's west entrance. We had climbed it once before in 2009 and I had climbed the Apgar mountain range highpoint with Wayne Phillips near Huckleberry Lookout in 2014, and we had backcountry skied to its foot in 2006. But, maybe because there has been so much tree growth since the 2003 Roberts Fire there, I simply did not recognize the hike. It is a nearly 2,000 feet climb over 3.6 miles on a trail that switchbacks comfortably to the top, offering amazing views of Lake McDonald to the East. The larch were still in full color, but tinged in an orange pre-saging a loss of needles as winter nears. It was fun to see how the Roberts Fire had hop-scotched the various ridge lines and even crest, leaving very tall larch and Doug Fir trees standing high above the uniform lodgepole and fir regrowth. There were large swatches of untouched, older larch that broke up the new, green stands, creating a colorful palette. Unfortunately, there were clouds and a thick haze that filled the valley near Columbia Falls that obscured our views. I think it was the haze came from several large slash burns. Katie's theory was that it came from forest fires in the area, still smoldering from their summer rampages. Probably a little of both. It is terrific that we can get up in the morning, drive across the Continental Divide, and hike to a fire lookout in Glacier Park, and then return to Great Falls and enjoy a sun setting over our tawny-colored Great Plains resembling the Mongolian steppe and be home by 7 p.m. to watch the World Series. Katie and her hiking group decided to climb Scalplock Mountain above Glacier Park's Izaak Walton Ranger District near Essex, so I went up the road another 20 miles and climbed Ousel Peak in the Great Bear Wilderness. It is a 7.2 miles roundtrip climb with nearly 4,000 feet of elevation gain straight up from U.S. 2. The Middle Fork Flathead where a park trail goes to Harrison Lake is across the highway from the trailhead. This is the fourth time I've climbed this wonderful peak, which offers 360 views that include the southern part of Glacier Park to Logan Pass and south to the high peaks of the Bear, including Pyramid, and Grant. Glacier's St. Nick matterhorn is very visible. My intent was to take full advantage of the larch at the height of its color on a clear day where temperatures promised to warm into the 60s. I didn't count on my starting time temperature of 28 degrees, a bit frosty for my taste. The trail goes straight to the top with little let up, gaining about 1,200 feet per mile in deep larch, cottonwood, birch and Doug fir forest. Where the trail breaks out into the open the larch full presented itself. It spangles the Glacier and Great Bear forests down to the Middle Fork. Although this was a weekend and the weather ideal, I encountered no one else on this 6 hour trek. The only problem was hard-pack snow for the final 650 feet of elevation gain. The trail to the summit is north-facing and the thawing and freezing has left an icy veneer. I left the trail and went into deep deadfall and timber to safely navigate the trip to and from the top. On the top itself, it was clear. The larch are at the height of their gold/yellow splendor and not to be missed. We took last weekend to enjoy the show, venturing to the west side for a stay in Polebridge at the Mercantile's cabins. On the way there we stopped along the Middle Fork Flathead at mile marker 167 and did the short hike (3 miles round-trip) to the top of the former Garry Lookout site that offers great views into Glacier's south end and the Middle Fork, which is spangled in larch colors. The elevation gain and loss is just under 1,000 feet. The following day we did the 13-mile round trip Bowman-Quartz lakes loop that gains and loses about 2,700 feet. This day-long hike begins along the south shore of Bowman Lake beneath Rainbow Peak, crosses the Cerulean Ridge and then drops down at mile 6 to Upper Quartz Lake. It then heads south, passing Middle and Lower Quartz lakes before regaining the Cerulean Ridge and then dropping steeply on switchbacks to Bowman Lake. Most of the hike is in deep larch forest with tons of blow down that has been laboriously cleared from the trail by Park Service crews. On the way in it broke out of the forest canopy at the ridgeline, offering views of the three Quartz lakes and snow-covered Vulture Peak. The view at the west end of Upper Quartz Lake at the backcountry campground is especially thrilling, looking toward Vulture and the forest lit up by the larch. The cabins at Polebridge Merc are comfortable and clean, but the wood stove didn't have a damper and I roasted inside despite outside temperatures than fell to 15 degrees. The Merc bakery and its huckleberry bearclaw pastry are legendary. We had a meal a couple of miles south of there at a small resort that is readying to close for the season. Along the road we got to see the dark, black grizzly that has been hanging out in a wild oats field for the past couple of weeks gorging on the grain. He has been on a feeding frenzy in anticipation of the nearing winter. Our weather was chilly and cold in the morning, but clear. It warmed to about 50 degrees while we hiked. It was very pleasant and at night the skies revealed a myriad of stars and the Milky Way. It was a thrilling way to spend three days. It was interesting to see that the east side of the Continental Divide had gotten considerably more early snow than the west side. Usually it's the other way around. The east side has really gotten hammered. Hope it sticks around for a good ski base. We decided to stay with the larch-color on the way home and came down by way of the North Fork Flathead to Columbia Falls and down through the Swan and Seeley Lake, enjoying stops in Swan Lake, Salmon Lake and finally the Sculpture Garden in Lincoln.